The South Australian Advertiser, as it was originally titled, was founded by the Rev. John Henry Barrow. Barrow was a Congregational pastor, member of parliament, ex-Register journalist, and a nephew of Charles Dickens. Sir Henry Ayers was the first chairman of the board of the newspaper. 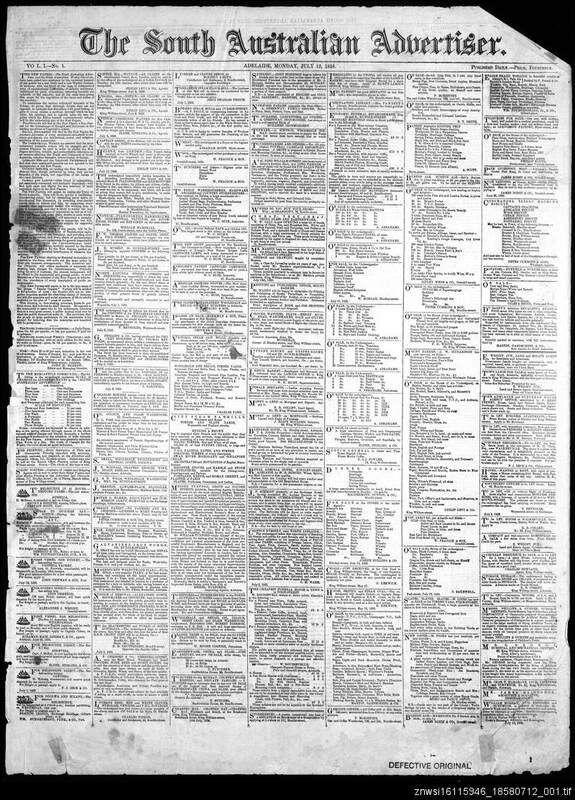 The earliest issues of the Advertiser were slim four-page productions. The weekly Chronicle was founded at the same time as the Advertiser as its weekend newspaper. From 1863 the company also published an evening newspaper, the Express. Following Barrow's death in 1874, another Congregational minister, William Harcus, became editor. In 1902 the Advertiser claimed to be the first newspaper in the state to use motor cars in conveying news reports. This was during the murder trial of Mary Schippan at Sedan in the Barossa Valley. In 1933 another first occurred when Bert Hussey flew Melbourne Cup photographs to Adelaide overnight, in time to be printed in the next morning's Advertiser. From 1864 illustrations began to appear in advertisements in the pages of the newspaper, with photographic illustrations being used in the Chronicle from October 1895. Regular photographic supplements appeared in the Chronicle from 1902 to 1944. Between 1953 and 1955 a Sunday edition, the Sunday Advertiser, was published, which eventually amalgamated with the Sunday mail. The Advertiser was sold to a consortium led by Keith Murdoch of the News in 1929, and from this time the company progressively bought out rival Adelaide newspapers, including the Register. Murdoch's daughter, Helen Handbury was director of Advertiser Newspapers Ltd. until her death in 2004. At this time the newspaper had a daily circulation of over 200,000 copies. In 1992 the Advertiser began printing in full colour. From February 1942 news stories replaced advertising on the front page, a trend said to have begun in Australia with the Melbourne Herald in 1889. With the closure of the News in 1992, and the take over of the Messenger Newspapers group in 1983, the Advertiser has come to hold a monopoly on print news-reporting in South Australia. The newspaper changed from broadsheet to tabloid size in 1997. In 1983 the Advertiser took control of the suburban Messenger Newspapers. The Advertiser on-line news site is Adelaide Now.